Carbon Monoxide Safety Keep You & Your Family Safe This Winter Many Canadians are exposed to the deadly effects of Carbon Monoxide each year in their own homes. Hundreds are hospitalized each year with Carbon monoxide poisoning, which often can lead to permanent disability. 88% of all homes have something that poses a Carbon Monoxide threat, so taking steps to protect yourself and your family is key to avoiding and/ or identifying leaks. What Are The Main Sources of Carbon Monoxide in my Home? Wood burning/gas stoves, gas refrigerators, gasoline engines, kerosene heaters and others. How Can I Tell if There is a Carbon Monoxide Leak in my Home? The elderly, children and people with heart or respiratory conditions may be particularly sensitive to carbon monoxide. Install the carbon monoxide detector (s) in accordance with the manufacturer's instructions. What Should I Do if my Carbon Monoxide Detector Starts Beeping? Always react to a carbon monoxide detector that has alarmed! Your knowledge of the dangers of carbon monoxide may help to save the life of a loved one in the event of a leak. Having a detector in your home is a good second line of defense, but proper care and maintenance of fuel burning appliances should always be a priority. Since carbon monoxide moves freely in the air, the suggested location is in or as near as possible to sleeping areas of the home. The human body is most vulnerable to the effects of carbon monoxide during sleeping hours. to work properly the unit must not be blocked by furniture or draperies. 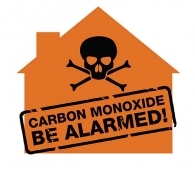 Carbon Monoxide is virtually the same weight as air and therefore the alarm protect you in a high or low location. for maximum protection, a carbon monoxide detector should be located outside primary sleeping areas or in each level of your home. Near paint thinner fumes or household cleaning products. Ensure proper ventilation when using these types of chemicals. Within 1.5 M (5 feet) of any cooking or open flame appliances such as furnaces, stoves, and fireplaces. In exhaust streams from gas engines, vents, flues, or chimneys. Do not place in close proximity to an auto mobile exhaust pipe; this will damage the detector. Test your carbon monoxide detector regularly to make sure it is operating properly. The owner's manual should tell you how to test your alarm. Remember to check the manual for information on when to buy a new carbon monoxide detector.